Preview: Red Cap Patisserie Brings Creative European Pastries to Meadow Street | Food and Drink | Style Weekly - Richmond, VA local news, arts, and events. Ash Daniel John and Martine Wladar are offering a creative take on French and European pastry at Red Cap Patisserie. The French believe that they make the best food in the world, and chefs there — and here — are trained to follow their traditions strictly. That doesn’t mean all of them do, but there’s pressure to keep French food precisely French — no changes. Given France’s history, it seems a little incongruous. Although we focus on the American Revolution as the most spectacular thing to happen to democracy since it was a twinkle in ancient Greece’s eye, our conflict with Britain was more like a blip. The big, transformative historical event that pushed most countries in the Western world toward democracy was the French Revolution. OK, history lesson over. That wasn’t so painful, was it? It also gives you a little insight into exactly what might be happening behind the door of Red Cap Patisserie in the old Lucille’s Bakery space on Meadow Street. The logo’s red hat — or bonnet rouge — was worn as a symbol of liberty during the French Revolution. “We want to make a product we like,” bakery co-owner Martine Wladar says, emphasizing the word “we.” Along with her husband, John, she’s producing French pastry that’s not exactly French — the technique may be there, but the ingredients and flavors are a little different than what you might expect. Tourtières are a perfect example. They’re French Canadian meat pies, and Martine makes them with ingredients such as pork, plums and pears, or chicken, bacon and peas instead of the traditional ground meat and potatoes. Not French, not Canadian, but a different kind of flaky little pies that Richmonders can eat on the go. She chooses her own uniform now — a black chef’s jacket and a soft red cap reminiscent of her store’s logo. After years of catering in Manhattan for clients who included Martha Stewart, she learned an important lesson, she says: “Make it happen.” No matter what. As I talk to the Wladars, neighbors walking by call through the screen door to find out when the shop will open. Since Lucille’s closed, the neighborhood has been bereft. For Martine, it’s an exciting opportunity to establish her own place in Richmond. 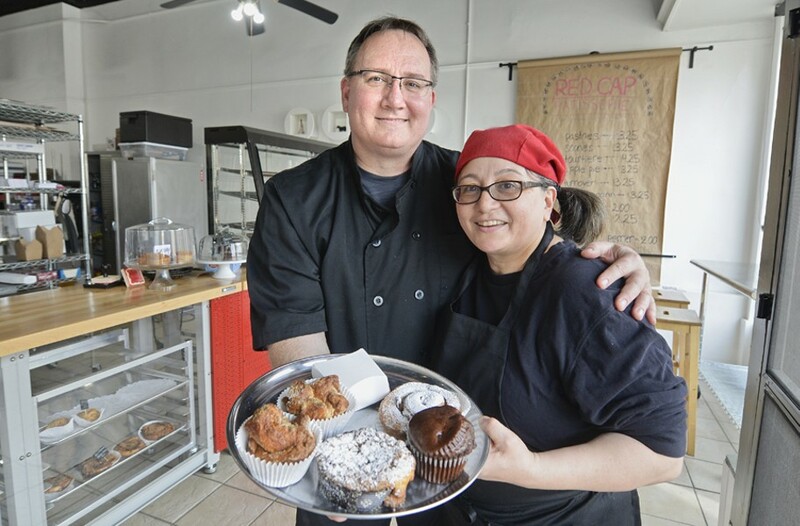 Red Cap Patisserie, Wednesdays-Saturdays 10 a.m.-6 p.m. 719 N. Meadow St., redcaprva.com.